Planning your Christmas campaign? Don't commit the #1 crime. Planning your Christmas campaign? Don’t commit the #1 crime. This is Grant. Grant works at an online marketing agency, helping brands and retailers to engage and develop their audiences and, ultimately (though Grant prefers not to dwell on this bit), transition them into paying customers. You can’t see them in this picture, because he’s facing his ‘ideas board’, but Grant’s wearing a pair of glasses so expensive they’re worth more than most people’s cars. To pay for his costly eyeware habit, Grant has to maximise his own revenue while putting in the least possible number of “cycles” (or “do the least possible amount of work”, for anyone who doesn’t speak ‘marketing-ese’). And Grant’s favourite tactic to achieve this? Sell all his clients the same old crap. That’s why Christmas comes early every year for Grant because, each June, he persuades most of his clients to plan an “innovative and interactive” advent calendar for the holidays ahead, where customers unlock a cool deal or giveaway every day in the run-up to December 25th. It’s the easiest sell in the world for Grant beause, for some unknown reason, brands and retailers seem to think it’s an innovative and creative idea – even though all their competitors are doing exactly the same thing and have been since about 2004. Now, we’re not saying that Grant was responsible for all the campaigns we’ve screen-grabbed above (mainly because he’s a fictional ‘type’ and we just made him up to illustrate a point). 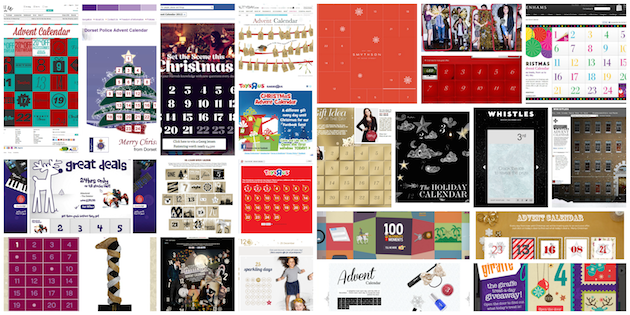 But, seeing as how it only took us about 20 seconds to find so many examples, it does rather back up our argument that online advent calendars are about as innovative as the Christmas TV schedules. They’re the ‘Dad’s Army’ of marketing. They weren’t always such a cliché: it was pretty cool when Apple launched their “12 Days Of Christmas” iTunes giveaways in the late Naughties, (athough, even then, we remember thinking that 12 days seemed a bit miserly when everyone else was doing the full 25). But, now that everyone from the Nisa convenience store chain to the Dorset Police Force have started doing them, the concept has definitely run out of road. So, let’s have a think what Grant’s clients are hoping to achieve here. They’re looking for something that’s natively online, something that’s inherantly viral and share-worthy, and something that’s immersive and engaging. The problem is: no one’s going to share a campaign when they and everyone they know receive a dozen identical invites in their inboxes or social timelines every day. And no one’s going to feel immersed or engaged when they’re being offered exactly the same giveaways and money-off deals as absolutely everyone else. Given that most of the campaigns also share the hookline “Our gift to you”, their real-world equivalent would be socks. Socks for everyone. Socks for you, for you dad, for your mum and your gran. Socks. Wow. Socks. No, if these brands and retailers really want to trigger sharing, acquire new customers and engage their audiences, they need to craft campaigns which feature offers that improve as they get shared. It’s a crazy idea but, giving people an incentive to share makes them share more. Who’d have thought it? Finally, in exactly the same way that you don’t give your postman the same thing you give your other half, you need to give something smaller to the people who don’t do a lot for you and something bigger to the people who go the extra mile. In this case, if a customer gets wind of your Christmas campaign, buys a load of stuff themselves, then shares the stuffing out of it, bringing in a nativity’s worth of sparkly new customers? Well, come on: they deserve an extra mince pie or two. Especially, if you want them to rock just as hard come Easter / Summer / your next seasonal campaign. Essentially, a little innovation goes a long, long way, but you’d be amazed how many brands go for ‘advent’ over ‘invent’. This year, why not try something a little different? Grant won’t thank you, but your customers will.